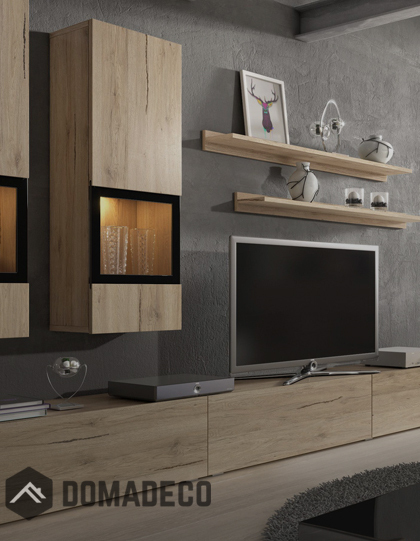 Modern wall unit perfect for many a interiors. Light colors give it a fresh look and and the wooden texture makes it feel natural. Width - 309 cm - 121,7"
Depth – 52 cm - 20,5"
Glass-fronted display cabinet (left side): 190/54/42 cm - 74,8"/21,3"/16,5"
Glass-fronted display bookshelf (right side): 146/90/42 cm - 57,5"/35,4"/16,5"
TV stand: 43/165/52 cm - 16,9"/65"/20,5"
Shelf: 22/120/20 cm - 8,7"/47,2"/7,9""